Astronauts returning to Earth sometimes feel light-headed. It's been a problem since the earliest days of human space exploration, but now doctors may have a solution. "Cosmonauts who spent a long time onboard Mir commonly had to be carried away in stretchers when they came home," recalls Williams. 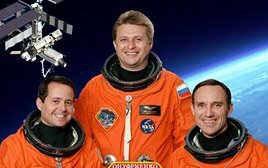 Fortunately, their Soyuz return capsules did not require a pilot to land, so it didn't matter much. Shuttle pilots, on the other hand, must perform complex re-entry procedures. To them it matters a great deal. Orthostatic hypotension can strike Earth-dwellers for many reasons: Weak hearts might not pump enough blood, for example. Certain medications or even a hot shower can dilate blood vessels and cause blood pressure to drop. Women -- especially pregnant women -- are more likely to suffer from it than men. "Some patients with this condition are afraid to leave home or even get out of bed," writes neurologist Phillip Low of the Mayo Clinic. Astronauts experience orthostatic hypotension because of the way human bodies respond to gravity, explains Richard Cohen of the Harvard-MIT Division of Health Sciences and Technology. (Cohen leads the Cardiovascular Alterations Team at the National Space Biomedical Research Institute, or "NSBRI.") On Earth gravity pulls blood toward the lower body. But in space -- either in free-fall or far from a source of gravity -- blood that normally pools in the legs collects in the upper body instead. That's why astronauts have puffy-looking faces and spindly "chicken legs." It's a classic case of "use it or lose it." Veins in human legs contain tiny muscles that contract when the veins fill with blood. Their function is to send blood uphill toward the heart and so maintain blood pressure. But in space there is no "uphill," so those tiny muscles in the veins are less-used -- a normal adaptation to weightlessness. During re-entry those muscles are needed again, but they have temporarily "forgotten" how to contract. They fail to push blood back toward the heart and brain. "This effect is more severe after prolonged space flights," notes Cohen. Right: Muscles in the veins of the legs help force back uphill toward the heart. From Grey's Anatomy. For many years astronauts have tried to counteract orthostatic hypotension by drinking lots of salt water, which increases the volume of bodily fluids. (There is a general loss of body fluids during space missions.) Astronauts also wear "G-suits" -- rubberized full-body suits that can be inflated with air. This action squeezes the extremities and raises blood pressure. Such countermeasures are only partially effective. "Almost all returning astronauts experience changes in gait and balance," continues Williams. Nevertheless, "most are able to walk around just fine. A small number experience orthostatic changes that render them quite dizzy." An anti-dizzy pill would be helpful, but until recently there was no such thing. Enter Midodrine: Midodrine is the first drug approved by the United States Food and Drug Administration to treat orthostatic hypotension. It constricts blood vessels and so increases blood pressure. "By increasing blood pressure when patients need it, Midodrine can help people lead a more normal life," writes Low. Cohen thinks it might help astronauts, too. Below: ISS crewmembers will soon participate in tests of Midodrine. Pictured here is the crew of the ISS Expedition Four. Cohen works with Janice Meck, head of the Cardiovascular Lab at NASA's Johnson Space Center, and Gordon Williams, a doctor at the Brigham and Womans' hospital in Boston, to study adverse effects of space flight on the human cardiovascular system. Following animal studies and computer simulations (performed by members of the NSBRI Cardiovascular Alterations Team), they conducted bed-rest testing of real humans -- a situation that simulates the effect of space travel on the cardiovascular system. Astronauts, they concluded, would likely benefit from the drug. An important advantage to Midodrine, says Cohen, is that it can be administered just before re-entry or even after landing. The benefits are immediate. Astronauts wouldn't have to take it throughout their mission when it might interfere with their body's own (and welcome) adaptations to zero-g.
"A flight study protocol has recently been approved to test the drug's effects on space shuttle astronauts and ISS crewmembers," says Cohen. Perhaps soon astronauts returning home from space will feel lightheaded -- but only due to elation. Orthostatic hypotension will have nothing to do with it. NASA's Office of Biological and Physical Research supports studies of the human body in space. 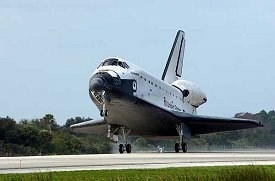 Test of Midodrine as a countermeasure against postflight orthostatic hypotension -- Janice M. Meck and colleagues will test Midodrine on shuttle astronauts and ISS crewmembers. G-suits: a picture and more information.